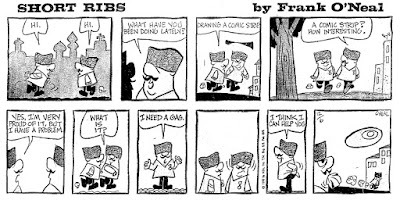 When people talk about the importance of character over jokes, there are two samples in the comic strip world I always mention. One is the way Johnny Hart's BC slided from an excellent and very funny character based strip to a puns based vehicle, with interchangeable characters sitting behind a rock throwing one-liners at each other. On of the most galling was the bit where one of them throws a message on a stone into the see and waits until an answer returns, usually some sort of pun to the original question. The bit of the floating rock is funny the first time, but it gets boring soon enough and all you have left is a drawn out pun, not even worthy of a daily gag. 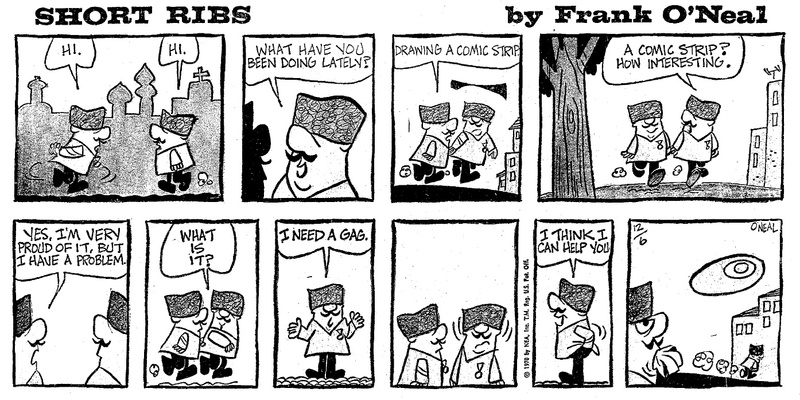 The other example is the long running strip Short Ribs by Frank O'Neill. Instead of having one set of characters, he had several sets of not so very well defined characters with the jokes usually about the world they inhabited (cavemen, cowboys, knights, Russians). I really like the way it was drawn, but the jokes always held it down. But I keep trying. Here is a whole load of dailies from various periods and I have a whole stack full of Sundays waiting to be scanned upstairs.